Sabor Del Northside is a cultural arts festival that celebrates the flavors of the Northside and its vibrant, diverse community. The festival will include a Salsa contest, student art show, vendor fair, and arts and crafts activities for the whole family. 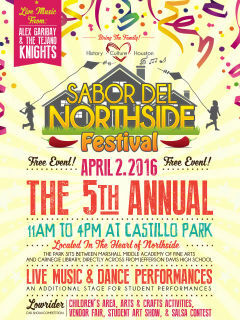 Music will be provide by headliners Alex Garibay & The Tejano Knights.